Welcome to the Sonoran Spa Resort: 1, 2 & 3 bedroom condo rentals beachfront condominium rentals in lovely Rocky Point (Puerto Peñasco), Mexico. Enjoy unobstructed views of the beautiful Spa of Cortez. Amenities range from fitness center, clubhouse, 2 Jacuzzis, 3 swimming pools (one is heated), tennis court, full service spa, Sonoran Grill Restaurant, convenience and liquor store, each condo individually decorated, fully equipped kitchens, video arcade and activity rents. Take a Mexican vacation close to home; without the hassle of air travel, passports, visas or customs. Come as a family, with a group, alone or as a couple, and get a taste of Mexico at it's finest. Why stay at a hotel, when you can have it all right here? Find out why so many of our rental clients have made Sonoran Spa their home away from home again and again. Enjoy a beverage or snack at the Sonoran Grill Restaurant, while sun bathing, playing volleyball or relaxing under a palapa in our own private beach area. Nothing feels better than a hot Jacuzzi, while watching a magnificent sunset or star filled sky. Need something from the store? Stop by the commercial center located at the front entrance Walk next door to Sonoran Spa Resort, where you can pamper yourself at "La Spa" a full service facility offering massages, pedicures, manicures, skin and body treatments. For terrific food and ocean view dining visit "Sonoran Grill" or any of the great Rocky Point Restaurants, less than 10 minutes away. The condos are graciously decorated by their individual owners and have to meet our criteria. All condos come equipped with everything you need for an unforgettable vacation. Sonoran Spa is the perfect destination for a family vacation. Experience absolutely unobstructed ocean view and the most beautiful sunsets from your own private oceanfront balcony. Don't be deceived by other properties in Rocky Point that claim proximity to the ocean, only to find out later that you have to drive or walk for miles before you reach the beach. And even if you reach the beach, you may find a rocky beach. That is not the case with Sonoran Spa, which is located in "Sandy Beach". Why is it called Sandy Beach? Because it is! Craving for more? Click on our "Gallery" section for a more complete slideshow. The area of Sandy Beach is the first major resort area in Rocky Point to include all underground utilities (gas, water and electricity). If you are familiar with Rocky Point, you know that it is very difficult to find a rental property with utilities, unless you stay at the usual "chain" hotels. The units are fully air conditioned (central air) and include TV with satellite cable and VCR (DVD's in selected units), and even a stereo with CD player - so you can mix the sounds of the waves with your favorite music, while enjoying the beautiful ocean view. Don't worry about packing too much, as the units come with a laundry room with a washer and dryer (we even provide detergent and dishwashing soap), iron and ironing board. We want you to spend more time on your pursuit of rest and relaxation. Want some fun with the kids? Ride the banana boats! Rocky Point has been designated Arizona's beach. Nonetheless, many of our rental clients come all the way from California, New Mexico, Colorado and even Canada. Why? Simple: Our amenities and the warm and clean blue waters of the Spa of Cortez. 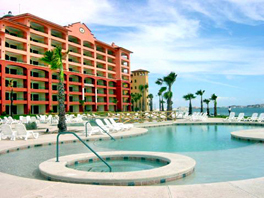 Sonoran Spa Luxury Condo Rentals is brought to you by Rocky Point Travel - Rocky Point's Travel Agency.